Bio: The Autobots unite with Titan Master partnersto power up for battle! Hyperfire boosts the speed of Blurr even further � some bots even say fast enough to outrun blaster fire. Christ, Blurr. On paper, he should be pretty awesome. He's sleek, and has speed as a special power. He should be like The Flash. Instead, we just got a guy who talks really quickly and came across as a bit of clumsy berk. 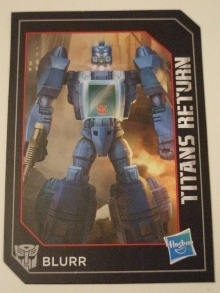 He clocked up some short appearances in the '86 Movie and Season Three and Four of the original cartoon, ending up partnered with the Targetmaster Haywire after losing a race with Hotrod and Daniel. FFS. His contemporary comics appearances were similarly annoying, just occasionally yammeringawyatgreatspeedlikethis.Becausethisiswhattalkingfastincomicslookslike. Thankfully, Transformers : Animated and IDW have done some work to rehabilitate the character from this pile of underdeveloped quirks, recasting him as an Elite Guard and famed Cybertronian athlete respectively. Which is a bit better. 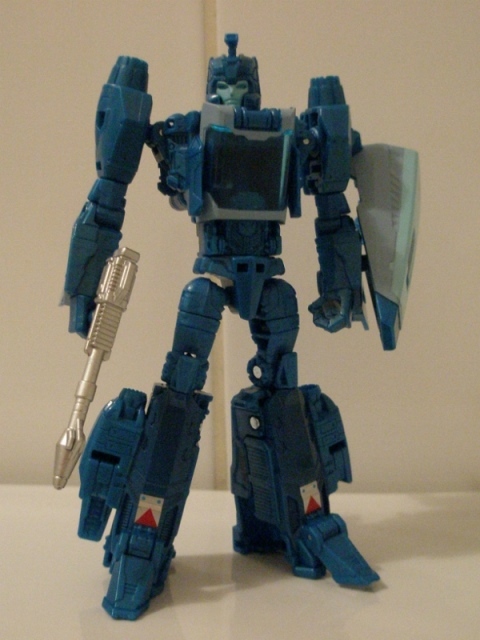 In terms of toys, Blurr suffered one of the weakest toys of the entire Movie cast. Not bad going when you're up against Kup and his cleavered head. He's had various redecos of existing moulds over the years, the best of which had previously been his Animated figure, which was pretty rad. 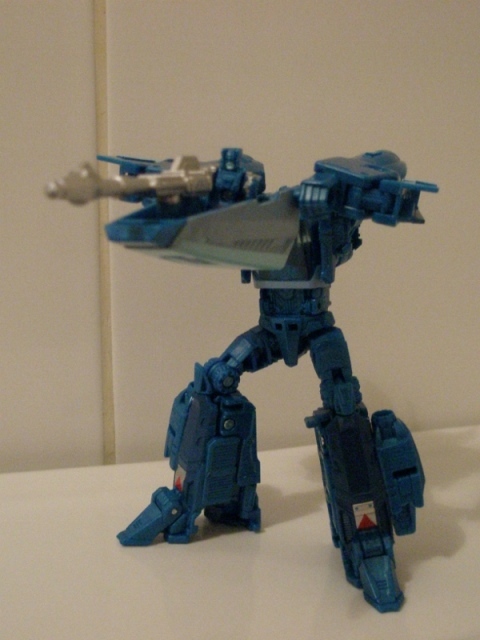 Robot Mode: Blurr is incredibly blue in robot mode. 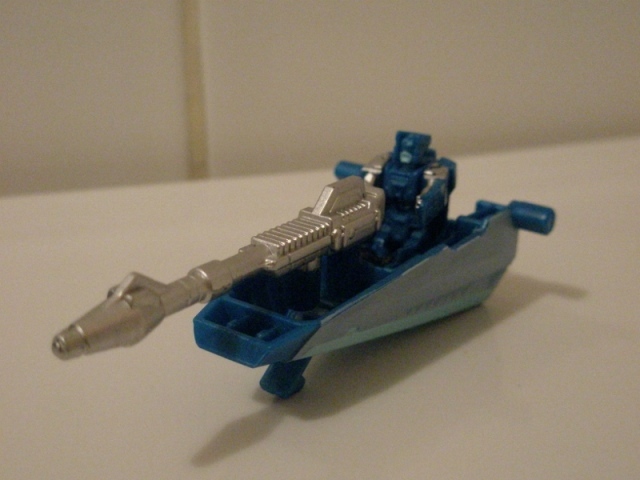 He's this shimmery sea shade of blue with some darker version of the same and some light blue highlights � mainly his wide mouthed face and around the cockpit. Its a bit much and matches Titans Return Scourge in the who can be the bluest stakes. Its not an especially ugly colour, but it is very strong having it all one go like this. Some stickers on his shins do their best to add some additional points of ...colour, and bless them for trying. That's really it for the downsides, because Blurr has an otherwise excellent robot mode. Its essentially the Sunbow animation model made flesh. Its detailed, lithe and energetic looking, which suits his personality. Kibble is mostly kept to a minimum� just those tracksuit sleeves on his forearms and the turbines on his calves. The carry-over from the original toy is present and correct � the front of the alt-mode can form a shield for his robot mode. 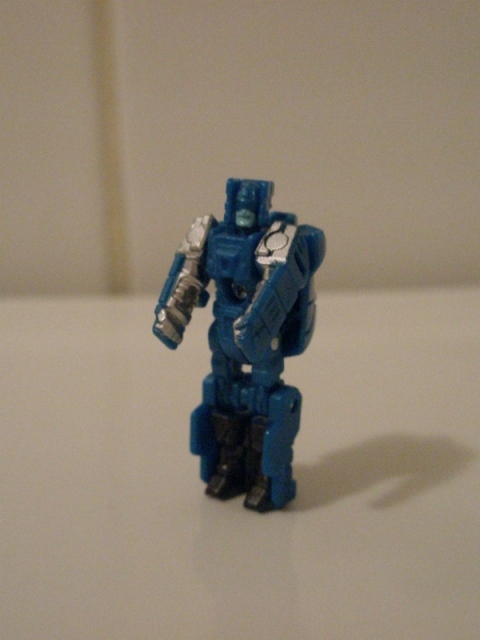 Blurr can wield this or you can just leave it clipped to his back. It does add a bit of bulk to him, but it doesn't look awful or intrusive � mostly I suspect because its rendered in a lighter shade of blue, so set against the rest of him, it isn't particularly noticeable. If it offends you too much, you can give it to a passing Titan Master to go sledging in. Most of the paint budget has gone onto his rifle, which is done up in Silver and looks like one of those Nerf football dart things. Robot Mode: Hyperfire is a decent Titan Master, and has a little more visual impact than most of these teeny robots, thanks to some daubs of black and silver on his arms and legs. He does the usual wavy arm thing and sitting down that the other Titan Masters can do, and that's your lot. 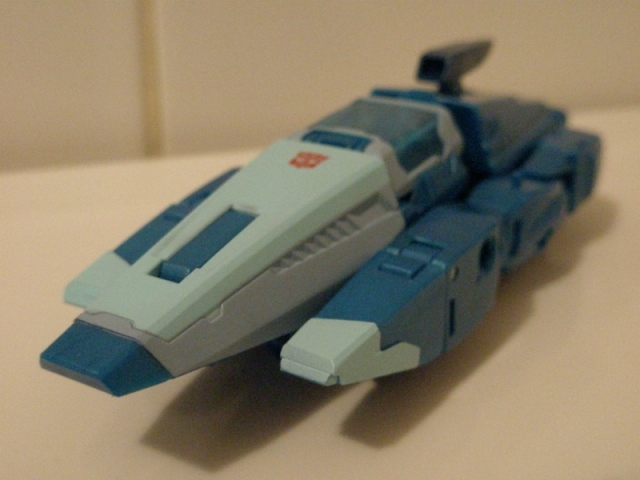 Alternate Mode: Blurr's vehicular mode is fantasic � its a lovely sleek land speed racer type thing. Its long and aerodynamic and I like the design cheat that makes this look like its hovering. Hyperfire can sit comfortably in the cockpit and I like marvelling at how awesome this looks. Its a bit rubbish to play with though � as all plastic wheeled cars outside of Hot Wheels are. It just doesn't roll terribly well, which is kind of boo.